So let’s take a look at the SD card communication. SD cards can operate in one of two modes; one is a proprietory system specific to SD cards which, until fairly recently was the subject of a certain amount of secrecy, while the other is a simple microcontroller-compatible SPI protocol, which is what we’ll use in the control module. I won’t cover the protocol in detail here, but the C source files CtrlModule/Firmware/spi. [c|h] handle the actual block-level transfer of data between FPGA and SD card. They do this by writing to two new hardware registers at 0xFFFFFFD0 and 0xFFFFFFD4. The first of these controls the card select signal, and also selects between fast and slow transfer speeds (SD cards must be initialised at a slow speed, but can then be driven faster.) The second register is used to transfer data. spiclk_in<='1'; -- Momentary pulse for SPI host. Block level access to the card is only half the story, however - we need to be able to access individual files and directories in the filesystem. This is handled by CtrlModule/Firmware/minfat.c, which is a minimal FAT32 filesystem implementation, again loosely based on similar code from the Minimig project but cut down and simplified to take up as little ROM space as possible. if(!FindDrive()) // Initialise the SD card, find the first partition (if applicable) and find the filesystem. What the project does with the data depends very much on the underlying core. In the OneChipMSX project the underlying core uses a Z80 program to read data from an EPCS4 configuration device, and writes that data to SDRAM, so I replaced that Z80 program with a simpler version and made the control module supply the data byte-by-byte, similar to how the EPCS4 does it. The PC-Engine core used a state machine to load data from a Flash chip, and again copied it to SDRAM, so I simply replaced the state machine with a version which received the data from the control module instead of the flash chip. This demo simply passes the data to the Host core via a 32-bit data channel, and with req / ack handshaking. 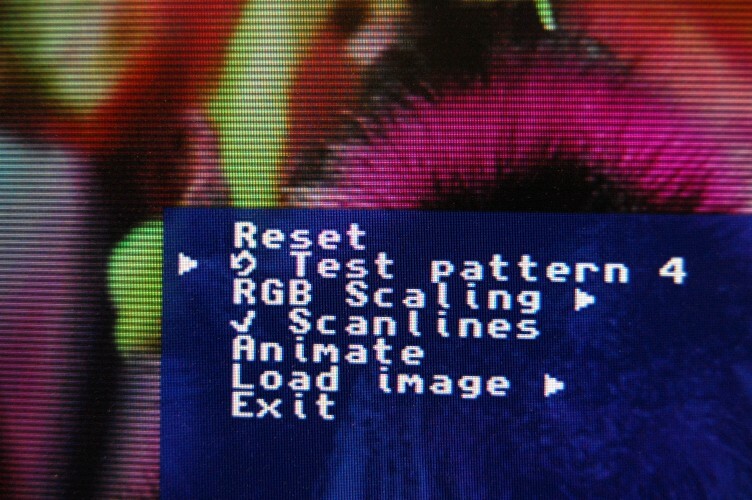 The host core writes the received data to SDRAM at the framebuffer address, so the VGA controller will display the contents of whichever file you select. The Github repo contains full source for the demo (Tagged as Step6), and also contains four raw 640x480x16 image files which should be copied to an SD card. The demo can load and display these files, and the menu options can be used to mess with the colours.